December 7, 2015 Tristin MckinstryLeave a Comment on Dodgers acquire Aroldis Chapman, What do they do with Jansen? Dodgers acquire Aroldis Chapman, What do they do with Jansen? The Los Angeles Dodgers and Cincinnati Reds have made the first trade of the Winter Meetings and it’s a big one. 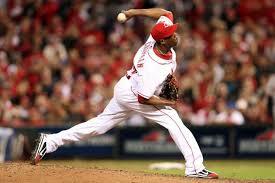 The Dodgers acquire closer Aroldis Chapman from the Reds for two prospects. Chapman, a four time all-star, will be a free agent at the end of the 2016 season. Chapman is a power closer. He threw the fastest pitch in MLB history at 106 MPH. However, the Dodgers making this trade makes little sense considering that they already have a closer. Kenley Jansen has popped up in trade rumors as of late now that the Dodgers acquired Champan. Neither Jansen nor Chapman want to pitch the 8th inning. So the question is: what do you do with Jansen? There’s a few ways LA could handle this. The obvious choice would be to deal Jansen. They could trade Jansen to a need who wants/needs a closer, maybe the Cubs, and get some prospects in return. They could try an take a more difficult route and, as Joel Sherman suggested on Twitter, convince him that teams will remember that he is a closer even if he pitchers one season as a set up guy. I would suggest that if you can’t trade him or convince him to pitch the 8th, let him share time with Chapman has the closer. Stay tuned to The Athletes Hub for all things Winter Meetings.